Special Delivery, 1885, 10¢ blue, right margin single, o.g., never hinged, choice centering, rich vibrant color, Extremely Fine; with 2003 P.F. and 2005 & 2012 P.S.E. certificates, the latter two Graded (XF 90, SMQ $3,500). 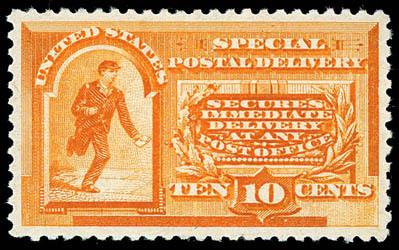 A WONDERFUL MINT NEVER HINGED EXAMPLE OF THE 1885 10¢ SPECIAL DELIVERY ISSUE. 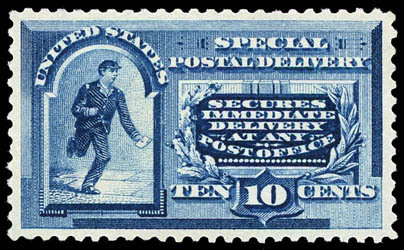 Special Delivery, 1888, 10¢ blue, o.g., never hinged, choice centering within well balanced margins, deep rich color on bright fresh paper, Extremely Fine, a lovely never hinged Special Delivery issue; with 2008 P.S.E. Graded certificate (XF 90, SMQ $3.325). Special Delivery, 1893, 10¢ orange, o.g., never hinged, precision centering amid beautifully balanced margins, rich bright color, Extremely Fine to Superb, a very scarce never hinged stamp in such choice condition; with 2011 P.S.A.G. Graded certificate (95, SSV $4,000). 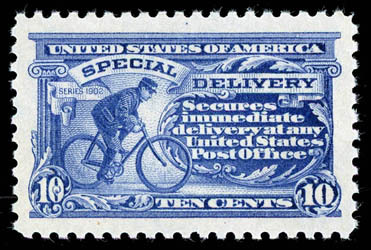 Special Delivery, 1902, 10¢ ultramarine, o.g., never hinged, beautifully centered within huge well balanced boardwalk margins which is very uncommon for this issue, strong vivid color and Post Office fresh, Extremely Fine and choice jumbo, the highest awarded jumbo grade by the P.S.E. 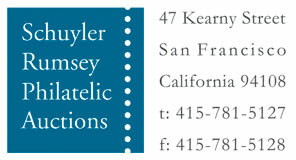 with five examples receiving this grade; with 2012 P.S.E. Graded certificate (XF 90J, SMQ $1,750). A MAGNIFICENT LARGE MARGIN NEVER HINGED EXAMPLE OF THE 1902 10¢ SPECIAL DELIVERY ISSUE. 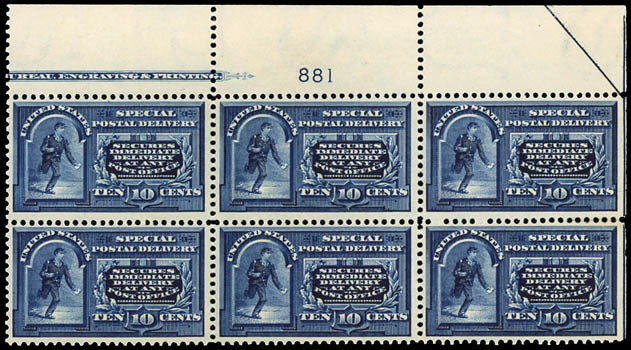 Special Delivery, 1902, 10¢ ultramarine, top margin plate number "1774" strip of 3 with imprint, o.g., never hinged, choice overall centering, rich vivid color on bright fresh paper, Extremely Fine, a beautiful plate number strip. Special Delivery, 1908, 10¢ green, o.g., never hinged, perfect centering within beautifully balanced margins, rich bright color and very fresh, Superb; with 2012 P.S.A.G. Graded certificate (98, SSV $1,150). 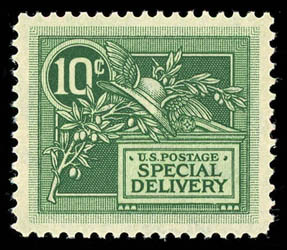 A WONDERFUL NEVER HINGED GEM EXAMPLE OF THE 1908 10¢ SPECIAL DELIVERY ISSUE. Special Delivery, 1911, 10¢ ultramarine, o.g., never hinged, choice centering amid huge well balanced boardwalk margins, deep rich color and Post Office fresh, an Extremely Fine to Superb jumbo; with 2016 P.F. Graded certificate (XF-Sup 95J, SSV $1,050 for 95 and $2,100 for 98). AN SUPERB HUGE MARGIN NEVER HINGED GEM EXAMPLE OF THE 1911 10¢ SPECIAL DELIVERY ISSUE. 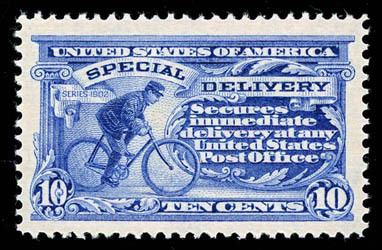 Special Delivery, 1914, 10¢ ultramarine, o.g., never hinged, remarkably well centered with beautifully balanced oversized margins, rich radiant color on bright fresh paper, an Extremely Fine to Superb jumbo, one of eight examples to receive this lofty grade with only three examples grading higher; with 2012 P.S.E. Graded certificate (XF-Sup 95J, SMQ $1,750). 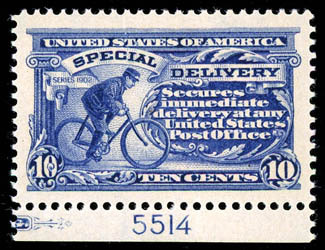 A WONDERFUL LARGE MARGIN GEM EXAMPLE OF THE 1914 10¢ SPECIAL DELIVERY ISSUE.